So I was a bit of a slacker this week, yes I was. But here I am, better late than never. 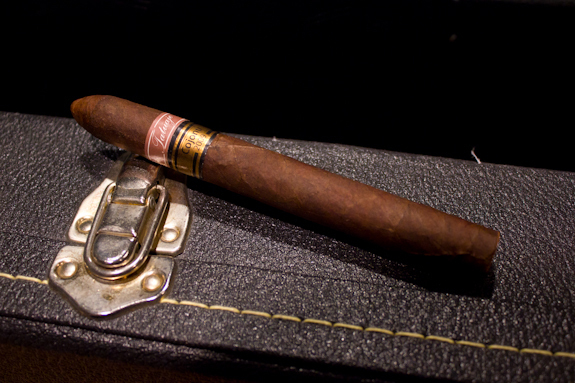 And to make up for it I am bringing you a nice Limited Edition cigar from Pete Johnson of Tatuaje cigars. 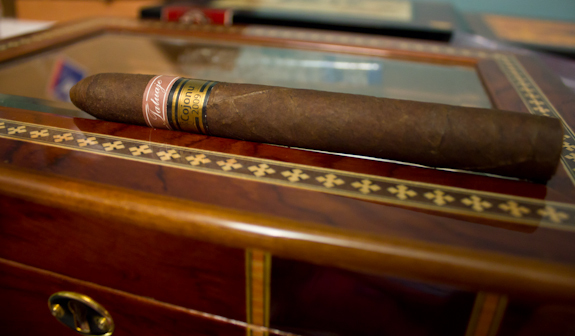 This particular cigar comes from the Reserva series and is called the Cojonu 2009. 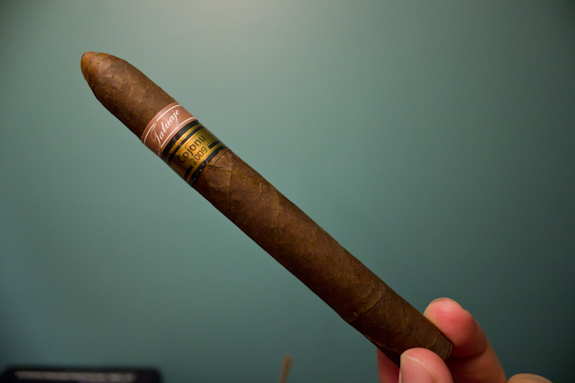 Now the Tatuaje Reserva Series is an extension of the popular brown label line called La Seleccion de Cazador. 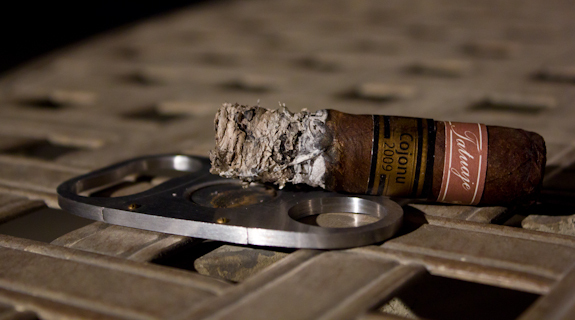 A few years ago, Pete Johnson started a limited release cigar called the Cojonu that would be released every 3 years. This is the 2009 edition and as I write this I believe most stores have already started receiving the recently released 2012 edition. 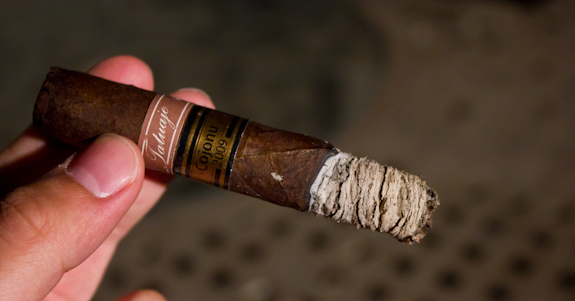 One quick note on the year in the name, it’s not related to the tobacco leaf age or anything like that, it’s specifically linked to the year it was released. The Tatuaje Cojonu 2009 was released on March of 2009 so as I smoke this it has just recently passed its 3 year anniversary. The blend in the Cojonu’s have an increased amount of Ligero over the brown label versions and are touted to be a fairly strong blend so nicotine sensitive cigar enthusiasts may want to tread lightly here. 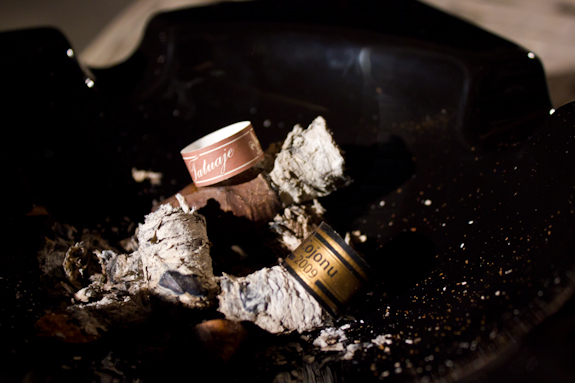 The 2009 edition is rolled at Don Pepin Garcia’s factory located in Miami, Florida, the El Rey de Los Habanos Factory. There are a total of 4 cigars in the Cojonu line, the Gran Cojonu, Cojonu 2003, Cojonu 2006, Cojonu 2009 and the most recent Cojonu 2012. The Gran Cojonu is the only one of the line that has no band. 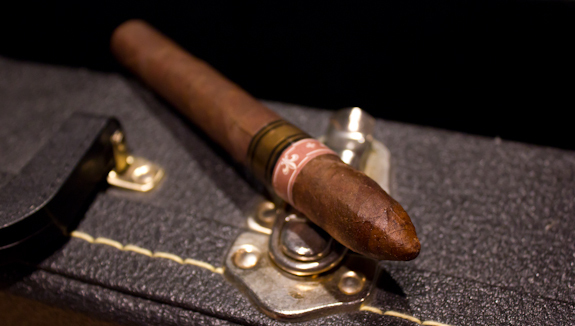 the other 4 cigars have the standard brown Tatuaje Label and on additional band. The black and gold band is standard for most of the Reserva lines and in our case today it simply says Cojonu 2009. Now let’s get to setting the flame to this cigar! •	The next ash reached the same 1 inch mark, even though this one was a lot cleaner it still lacked strength so I tapped it off to save it from a deadly plunge to the concrete! This is one of those cigars I was really trying to enjoy. It had a lot of the right elements but the whole package together didn’t sing huge praises for me. 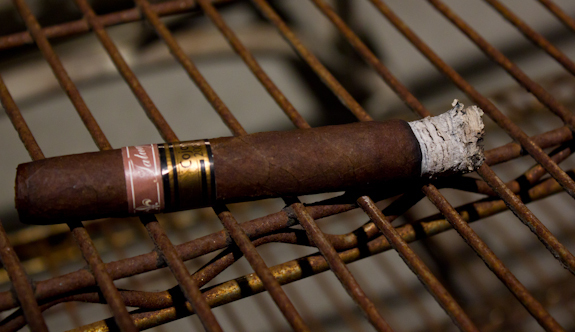 On the flavor front, there were some very enjoyable notes that kept me on my toes, that’s the part of this cigar I really enjoyed. It was the burn and draw issues that hampered the experience for me here. I did have a few samples before reviewing and it was the same story for the majority of them. So the flavors were awesome but the burn and draw left something to be desired, and at a price point of $13.00 I would have liked the whole package to be neat and tidy. I still think this is a worthwhile cigar to try and I will still seek out the 2012’s but I think Pete has some much better sticks under his belt that I would rather enjoy. Today’s pairing is yet another new port that I stumbled across at the store. It’s from Portugal, as are most ports, and the winery is called Quinta do Noval. Although it’s name is just “Black”, this bottle is another standard Late Bottled Vintage Porto with some nice labels and marketing to it. There’s actually a embossed bird on the glass near the bottom, not sure if it’s visible in the picture but it’s pretty neat. So this porto is not all marketing, it’s actually got a decent product in the bottle as well. At it’s base is a nice, full-bodied red that seems comparable to a Merlot. On top of that are some excellent dark berry notes and a hefty helping of oak flavors that make up for a delicious treat. 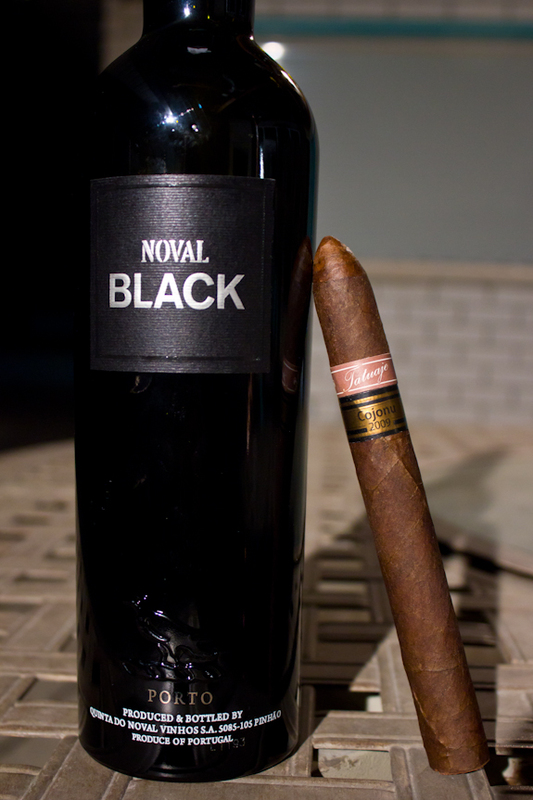 At only $17 a bottle, I can’t complain at all here, this was a great but and pairs perfectly with most any cigar. As you can guess, it made a great compliment to the Tatuaje Cojonu 2009. I think a nice scotch or strong espresso would also have gone well here. Thanks for another great review. Too bad about the burn issues, but the flavors sound enjoyable. 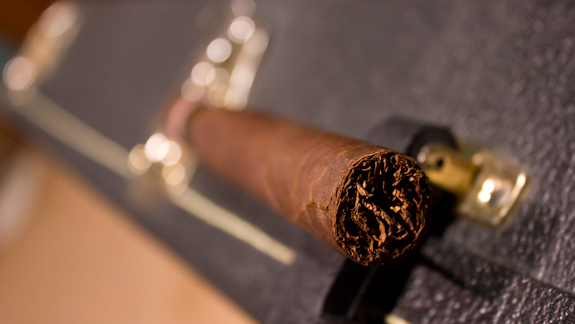 One question – do you purge your cigars when they start to get harsh? I think I’ve seen that port around here, so I may have to check it out sometime. After doing a little research, I found that the Black is actually a Reserve Ruby, rather than an LBV, but who cares – it sounds good! I’ve been sticking with the Graham’s “Six Grapes” port lately, since the liquor stores have had them at a great price. That’s interesting jjo! It didn’t say it was an LBV on the bottle but based on the flavor I assumed it was. I usually find the Ruby’s to be a lot sweeter. Very interesting indeed. It was tasty though so I’d definitely buy it again. The six Grapes stuff is pretty good, especially if you find it at a killer price! I haven’t been purging as much as I used to, but I hadn’t thought about doing it for a goofy burn. I’ll have to try it. I was surprised that you found the Black to have such a strong oak influence since it’s a ruby. Small wonder you thought it was an LBV. thanks again for the support bud! Are these actual limited editions? I think the year just means the style/ wrapper etc… but what do I know. I agree with you about the 09. I think the 06 is a bit better than the 09. But the ’12 CBL is amazing! I could be wrong here Tadd but I think each year is limited. The “Cojonu” line will continue but the blend will change with each release. If anyone knows for sure, feel free to chime in.